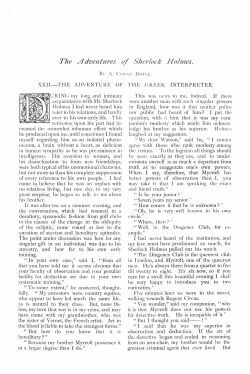 The Adventure of the Greek Interpreter (GREE) is a short story written by Arthur Conan Doyle first published in The Strand Magazine in september 1893. 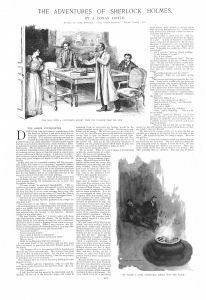 This is the 24th Sherlock Holmes story. 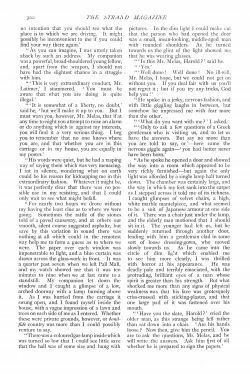 Collected in The Memoirs of Sherlock Holmes. Holmes pulled out his watch. He drew up the window. I was thrilled with horror. I saw someone coming towards me. 'Come in,' said he, blandly. "The man, with a compulsive effort, tore the plaster from his lips." "It threw a livid, unnatural circle upon the floor." 1985 : The Greek Interpreter (UK). Holmes : Jeremy Brett. Watson : David Burke. 1968 : The Greek Interpreter (UK). Holmes : Peter Cushing. Watson : Nigel Stock. 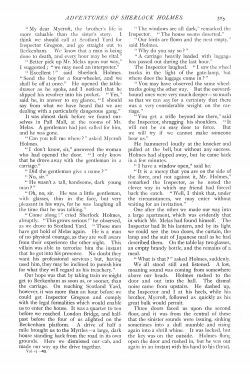 1955 : The Case of the French Interpreter (UK). Holmes : Ronald Howard. Watson : Howard Marion-Crawford. 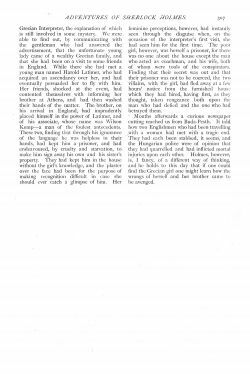 1922 : The Greek Interpreter (UK). Holmes : Eille Norwood. Watson : Hubert Willis. 2010 : The Greek Interpreter. Holmes : John Patrick Lowrie. Watson : Lawrence Albert. 1992 : The Greek Interpreter. Holmes : Clive Merrison. Watson : Michael Williams. 1960 : The Greek Interpreter. Holmes : Carleton Hobbs. Watson : Norman Shelley. 1943 : The Greek Interpreter. Holmes : Basil Rathbone. Watson : Nigel Bruce. 1940 : The Greek Interpreter. Holmes : Basil Rathbone. Watson : Nigel Bruce. 1931 : The Greek Interpreter. Holmes : Richard Gordon. Watson : Leigh Lovell. 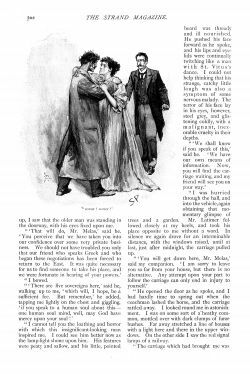 During my long and intimate acquaintance with Mr. Sherlock Holmes I had never heard him refer to his relations, and hardly ever to his own early life. This reticence upon his part had increased the somewhat inhuman effect which he produced upon me, until sometimes I found myself regarding him as an isolated phenomenon, a brain without a heart, as deficient in human sympathy as he was pre-eminent in intelligence. His aversion to women, and his disinclination to form new friendships, were both typical of his unemotional character, but not more so than his complete suppression of every reference to his own people. I had come to believe that he was an orphan with no relatives living, but one day, to my very great surprise, he began to talk to me about his brother. It was after tea on a summer evening, and the conversation, which had roamed in a desultory, spasmodic fashion from golf clubs to the causes of the change in the obliquity of the ecliptic, came round at last to the question of atavism and hereditary aptitudes. The point under discussion was how far any singular gift in an individual was due to his ancestry, and how far to his own early training. This was news to me, indeed. If there were another man with such singular powers in England, how was it that neither police nor public had heard of him? I put the question, with a hint that it was my companion's modesty which made him acknowledge his brother as his superior. Holmes laughed at my suggestion. Five minutes later we were in the street, walking towards Regent Circus. We had reached Pall Mall as we talked, and were walking down it from the St. James's end. 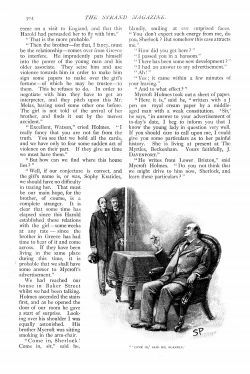 Sherlock Holmes stopped at a door some little distance from the Carlton, and, cautioning me not to speak, he led the way into the hall. Through the glass panelling I caught a glimpse of a large and luxurious room in which a considerable number of men were sitting about and reading papers, each in his own little nook. 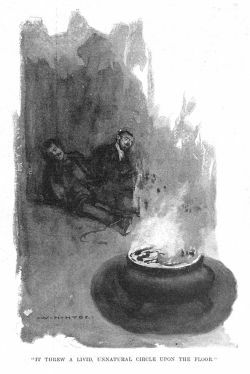 Holmes showed me into a small chamber which looked out on to Pall Mall, and then, leaving me for a minute, he came back with a companion who I knew could only be his brother. Mycroft Holmes was a much larger and stouter man than Sherlock. His body was absolutely corpulent, but his face, though massive, had preserved something of the sharpness of expression which was so remarkable in that of his brother. 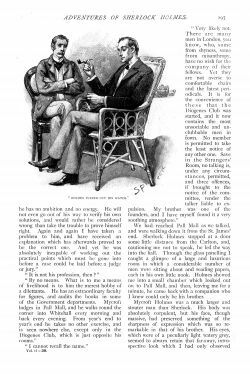 His eyes, which were of a peculiarly light watery grey, seemed to always retain that far-away, introspective look which I had only observed in Sherlock's when he was exerting his full powers. 'I am glad to meet you, sir,' said he, putting out a broad, flat hand, like the flipper of a seal. 'I hear of Sherlock everywhere since you became his chronicler. 'No, I solved it,' said my friend, smiling. 'An old soldier, I perceive,' said Sherlock. 'And very recently discharged,' remarked the brother. 'Royal Artillery, I fancy,' said Sherlock. 'That he has not left the service long is shown by his still wearing his "ammunition boots," as they are called,' observed Mycroft. I began to understand what my friend meant when he said that his brother possessed even keener faculties than he did himself. He glanced across at me and smiled. Mycroft took snuff from a tortoiseshell box and brushed away the wandering grains from his coat with a large, red silk handkerchief. 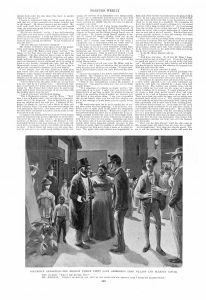 A few minutes later we were joined by a short, stout man, whose olive face and coal-black hair proclaimed his Southern origin, though his speech was that of an educated Englishman. 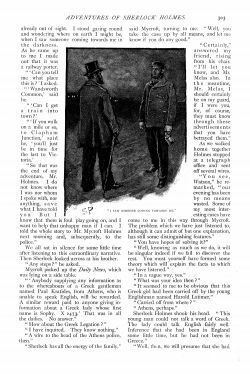 He shook hands eagerly with Sherlock Holmes, and his dark eyes sparkled with pleasure when he understood that the specialist was anxious to hear his story. 'I am all attention,' said Sherlock Holmes. 'This is Wednesday evening,' said Mr. Melas; 'well, then it was on Monday night - only two days ago, you understand - that all this happened. I am an interpreter, as, perhaps, my neighbour there has told you. I interpret all languages - or nearly all - but as I am a Greek by birth, and with a Grecian name, it is with that particular tongue that I am principally associated. For many years I have been the chief Greek interpreter in London, and my name is very well known in the hotels. 'It happens, not unfrequently, that I am sent for at strange hours, by foreigners who get into difficulties, or by travellers who arrive late and wish my services. I was not surprised, therefore, on Monday night when a Mr. Latimer, a very fashionably dressed young man, came up to my rooms and asked me to accompany him in a cab, which was waiting at the door. A Greek friend had come to see him upon business, he said, and, as he could speak nothing but his own tongue, the services of an interpreter were indispensable. He gave me to understand that his house was some little distance off, in Kensington, and he seemed to be in a great hurry, bustling me rapidly into the cab when we had descended into the street. 'I say into the cab, but I soon became doubtful as to whether it was not a carriage in which I found myself. It was certainly more roomy than the ordinary four-wheeled disgrace to London, and the fittings, though frayed, were of rich quality. Mr. Latimer seated himself opposite to me, and we started off through Charing Cross and up the Shaftesbury Avenue. We had come out upon Oxford Street, and I had ventured some remark as to this being a roundabout way to Kensington, when my words were arrested by the extraordinary conduct of my companion. 'He began by drawing a most formidable-looking bludgeon loaded with lead from his pocket, and switched it backwards and forwards several times, as if to test its weight and strength. Then he placed it, without a word, upon the seat beside him. Having done this, he drew up the windows on each side, and I found to my astonishment that they were covered with paper so as to prevent my seeing through them. '"I am sorry to cut off your view, Mr. Melas," said he. "The fact is that I have no intention that you should see what the place is to which we are driving. It might possibly be inconvenient to me if you could find your way here again." 'As you can imagine, I was utterly taken aback by such an address. My companion was a powerful, broad-shouldered young fellow, and, apart from the weapon, I should not have had the slightest chance in a struggle with him. 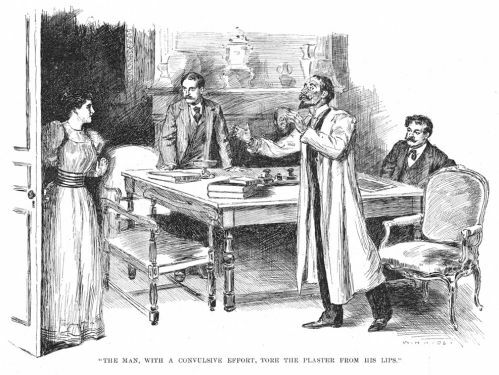 '"This is very extraordinary conduct, Mr. Latimer," I stammered. "You must be aware that what you are doing is quite illegal." '"It is somewhat of a liberty, no doubt," said he, "but we'll make it up to you. But I must warn you, however, Mr. Melas, that if at any time to-night you attempt to raise an alarm or do anything which is against my interests, you will find it a very serious thing. I beg you to remember that no one knows where you are, and that whether you are in this carriage or in my house, you are equally in my power." 'His words were quiet, but he had a rasping way of saying them which was very menacing. I sat in silence, wondering what on earth could be his reason for kidnapping me in this extraordinary fashion. Whatever it might be, it was perfectly clear that there was no possible use in my resisting, and that I could only wait to see what might befall. 'For nearly two hours we drove without my having the least clue as to where we were going. Sometimes the rattle of the stones told of a paved causeway, and at others our smooth, silent course suggested asphalt, but save this variation in sound there was nothing at all which could in the remotest way help me to form a guess as to where we were. The paper over each window was impenetrable to light, and a blue curtain was drawn across the glass-work in front. It was a quarter past seven when we left Pall Mall, and my watch showed me that it was ten minutes to nine when we at last came to a standstill. My companion let down the window and I caught a glimpse of a low, arched doorway with a lamp burning above it. As I was hurried from the carriage it swung open, and I found myself inside the house, with a vague impression of a lawn and trees on each side of me as I entered. Whether these were private grounds, however, or bona-fide country was more than I could possibly venture to say. 'There was a coloured gas-lamp inside, which was turned so low that I could see little save that the hall was of some size and hung with pictures. In the dim light I could make out that the person who had opened the door was a small, mean-looking, middle-aged man with rounded shoulders. As he turned towards us the glint of the light showed me that he was wearing glasses. '"Is this Mr. Melas, Harold?" said he. '"Well done! Well done! No ill-will, Mr. Melas, I hope, but we could not get on without you. If you deal fair with us you'll not regret it; but if you try any tricks, God help you!" 'He spoke in a jerky, nervous fashion, and with some giggling laughs in between, but somehow he impressed me with fear more than the other. '"What do you want with me?" I asked. 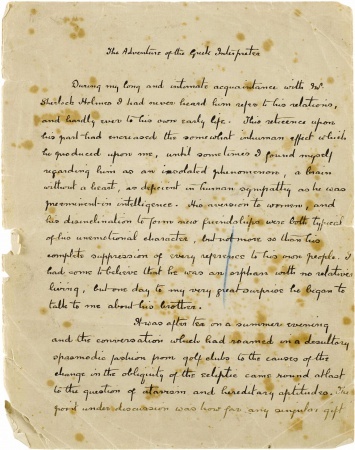 '"Only to ask a few questions of a Greek gentleman who is visiting us, and to let us have the answers. But say no more than you are told to say, or" - here came the nervous giggle again - "you had better never have been born." 'As he spoke he opened a door and showed the way into a room which appeared to be very richly furnished - but again the only light was afforded by a single lamp half turned down. The chamber was certainly large, and the way in which my feet sank into the carpet as I stepped across it told me of its richness. I caught glimpses of velvet chairs, a high, white marble mantelpiece, and what seemed to be a suit of Japanese armour at one side of it. There was a chair just under the lamp, and the elderly man motioned that I should sit in it. The younger had left us, but he suddenly returned through another door, leading with him a gentleman clad in some sort of loose dressing-gown, who moved slowly towards us. As he came into the circle of dim light which enabled me to see him more clearly, I was thrilled with horror at his appearance. He was deadly pale and terribly emaciated, with the protruding, brilliant eyes of a man whose spirit is greater than his strength. But what shocked me more than any signs of physical weakness was that his face was grotesquely criss-crossed with sticking-plaster, and that one large pad of it was fastened over his mouth. '"Have you the slate, Harold?" cried the older man, as this strange being fell rather than sat down into a chair. "Are his hands loose? Now then, give him the pencil. You are to ask the questions, Mr. Melas, and he will write the answers. Ask him first of all whether he is prepared to sign the papers." 'The man's eyes flashed fire. '"Never," he wrote in Greek upon the slate. '"On no conditions?" I asked at the bidding of our tyrant. '"Only if I see her married in my presence by a Greek priest whom I know." 'The man giggled in his venomous way. '"You know what awaits you, then?" '"I care nothing for myself." '"You can do no good by this obstinacy. Who are you?" '"I care not. I am a stranger in London." '"Your fate will be on your own head. How long have you been here?" '"Let it be so. Three weeks." '"The property can never be yours. What ails you?" '"It shall not go to villains. They are starving me." '"You shall go free if you sign. What house is this?" '"I will never sign. I do not know." '"You are not doing her any service. What is your name?" '"Let me hear her say so. Kratides." '"You shall see her if you sign. Where are you from?" '"Then I shall never see her. Athens." 'Another five minutes, Mr. Holmes, and I should have wormed out the whole story under their very noses. My very next question might have cleared the matter up, but at that instant the door opened and a woman stepped into the room. I could not see her clearly enough to know more than that she was tall and graceful, with black hair, and clad in some sort of loose white gown. '"Harold!" said she, speaking English with a broken accent, "I could not stay away longer. It is so lonely up there with only - oh, my God, it is Paul!" 'These last words were in Greek, and at the same instant the man, with a convulsive effort, tore the plaster from his lips, and screaming out "Sophy! Sophy!" rushed into the woman's arms. Their embrace was but for an instant, however, for the younger man seized the woman and pushed her out of the room, while the elder easily overpowered his emaciated victim, and dragged him away through the other door. For a moment I was left alone in the room, and I sprang to my feet with some vague idea that I might in some way get a clue to what this house was in which I found myself. Fortunately, however, I took no steps, for, looking up, I saw that the older man was standing in the doorway, with his eyes fixed upon me. '"That will do, Mr. Melas," said he. "You perceive that we have taken you into our confidence over some very private business. We should not have troubled you only that our friend who speaks Greek and who began these negotiations has been forced to return to the East. It was quite necessary for us to find someone to take his place, and we were fortunate in hearing of your powers." 'I cannot tell you the loathing and horror with which this insignificant-looking man inspired me. I could see him better now as the lamp-light shone upon him. His features were peeky and sallow, and his little, pointed beard was thready and ill-nourished. He pushed his face forward as he spoke, and his lips and eyelids were continually twitching, like a man with St. Vitus's dance. I could not help thinking that his strange, catchy little laugh was also a symptom of some nervous malady. The terror of his face lay in his eyes, however, steel grey, and glistening coldly, with a malignant, inexorable cruelty in their depths. '"We shall know if you speak of this," said he. "We have our own means of information. Now, you will find the carriage waiting, and my friend will see you on your way." 'I was hurried through the hall, and into the vehicle, again obtaining that momentary glimpse of trees and a garden. Mr. Latimer followed closely at my heels, and took his place opposite to me without a word. In silence we again drove for an interminable distance, with the windows raised, until at last, just after midnight, the carriage pulled up. '"You will get down here, Mr. Melas," said my companion. "I am sorry to leave you so far from your house, but there is no alternative. Any attempt upon your part to follow the carriage can only end in injury to yourself." 'He opened the door as he spoke, and I had hardly time to spring out when the coachman lashed the horse, and the carriage rattled away. I looked round me in astonishment. I was on some sort of a heathy common, mottled over with dark clumps of furze bushes. Far away stretched a line of houses, with a light here and there in the upper windows. On the other side I saw the red signal lamps of a railway. 'The carriage which had brought me was already out of sight. I stood gazing round and wondering where on earth I might be, when I saw someone coming towards me in the darkness. As he came up to me I made out that it was a railway porter. '"Can you tell me what place this is?" I asked. '"Can I get a train into town?" '"If you walk on a mile or so, to Clapham Junction," said he, "you'll just be in time for the last to Victoria." Mycroft picked up the Daily News, which was lying on a side-table. 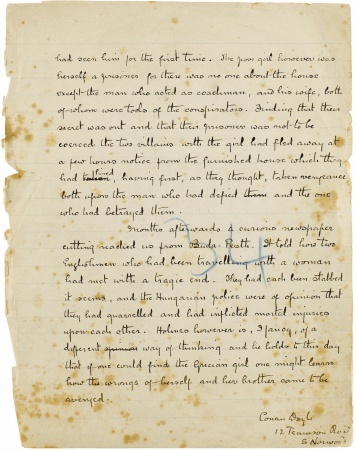 As we walked home together Holmes stopped at a telegraph office and sent off several wires. 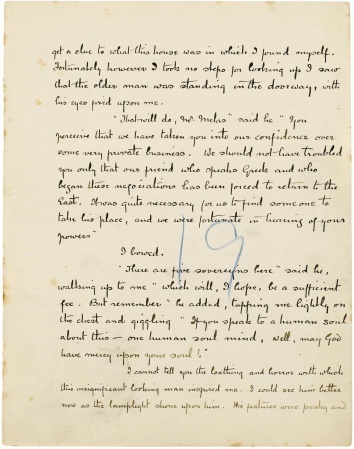 We had reached our house in Baker Street whilst we had been talking, Holmes ascended the stairs first, and as he opened the door of our room he gave a start of surprise. Looking over his shoulder I was equally astonished. His brother Mycroft was sitting smoking in the arm-chair. 'Here it is,' said he, 'written with a J pen on royal cream paper by a middle-aged man with a weak constitution. "Sir," he says, "in answer to your advertisement of to-day's date, I beg to inform you that I know the young lady in question very well. If you should care to call upon me, I could give you some particulars as to her painful history. She is living at present at The Myrtles, Beckenham. - Yours faithfully, J. DAVENPORT." 'Can you tell me where?' asked Mycroft Holmes. 'Come along!' cried Sherlock Holmes, abruptly. Our hope was that by taking train we might get to Beckenham as soon as, or sooner than, the carriage. On reaching Scotland Yard, however, it was more than an hour before we could get Inspector Gregson and comply with the legal formalities which would enable us to enter the house. It was a quarter to ten before we reached London Bridge, and half-past before the four of us alighted on the Beckenham platform. A drive of half a mile brought us to The Myrtles - a large, dark house, standing back from the road in its own grounds. Here we dismissed our cab, and made our way up the drive together. 'The windows are all dark,' remarked the Inspector. 'Our birds are flown and the nest empty,' said Holmes. 'I have a window open,' said he. One after the other we made our way into a large apartment, which was evidently that in which Mr. Melas had found himself. The Inspector had lit his lantern, and by its light we could see the two doors, the curtain, the lamp and the suit of Japanese mail as he had described them. On the table stood two glasses, an empty brandy bottle, and the remains of a meal. 'What is that?' asked Holmes, suddenly. We all stood still and listened. A low, moaning sound was coming from somewhere above our heads. 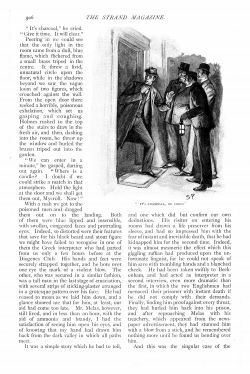 Holmes rushed to the door and out into the hall. The dismal noise came from upstairs. He dashed up, the Inspector and I at his heels, while his brother, Mycroft, followed as quickly as his great bulk would permit. Three doors faced us upon the second floor, and it was from the central of these that the sinister sounds were issuing, sinking sometimes into a dull mumble and rising again into a shrill whine. It was locked, but the key was on the outside. 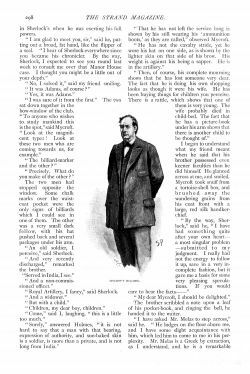 Holmes flung open the door and rushed in, but he was out again in an instant with his hand to his throat. Peering in, we could see that the only light in the room came from a dull, blue flame, which flickered from a small brass tripod in the centre. It threw a livid, unnatural circle upon the floor, while in the shadows beyond, we saw the vague loom of two figures, which crouched against the wall. From the open door there reeked a horrible, poisonous exhalation, which set us gasping and coughing. Holmes rushed to the top of the stairs to draw in the fresh air, and then, dashing into the room, he threw up the window and hurled the brazen tripod out into the garden. With a rush we got to the poisoned men and dragged them out on to the landing. Both of them were blue-lipped and insensible, with swollen, congested faces and protruding eyes. Indeed, so distorted were their features that, save for his black beard and stout figure, we might have failed to recognize in one of them the Greek interpreter who had parted from us only a few hours before at the Diogenes Club. His hands and feet were securely strapped together and he bore over one eye the mark of a violent blow. The other, who was secured in a similar fashion, was a tall man in the last stage of emaciation, with several strips of sticking-plaster arranged in a grotesque pattern over his face. He had ceased to moan as we laid him down, and a glance showed me that for him, at least, our aid had come too late. Mr. Melas, however, still lived, and in less than an hour, with the aid of ammonia and brandy, I had the satisfaction of seeing him open his eyes, and of knowing that my hand had drawn him back from the dark valley in which all paths meet. It was a simple story which he had to tell, and one which did but confirm our own deductions. His visitor on entering his rooms had drawn a life-preserver from his sleeve, and had so impressed him with the fear of instant and inevitable death, that he had kidnapped him for the second time. Indeed, it was almost mesmeric the effect which this giggling ruffian had produced upon the unfortunate linguist, for he could not speak of him save with trembling hands and a blanched cheek. 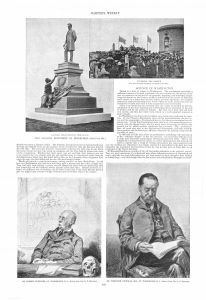 He had been taken swiftly to Beckenham, and had acted as interpreter in a second interview, even more dramatic than the first, in which the two Englishmen had menaced their prisoner with instant death if he did not comply with their demands. Finally, finding him proof against every threat, they had hurled him back into his prison, and after reproaching Melas with his treachery, which appeared from the newspaper advertisements, they had stunned him with a blow from a stick, and he remembered nothing more until he found us bending over him. And this was the singular case of the Grecian Interpreter, the explanation of which is still involved in some mystery. 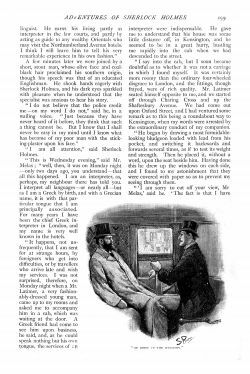 We were able to find out, by communicating with the gentleman who had answered the advertisement, that the unfortunate young lady came of a wealthy Grecian family, and that she had been on a visit to some friends in England. While there she had met a young man named Harold Latimer, who had acquired an ascendancy over her, and had eventually persuaded her to fly with him. Her friends, shocked at the event, had contented themselves with informing her brother at Athens, and had then washed their hands of the matter. The brother, on his arrival in England, had imprudently placed himself in the power of Latimer and of his associate, whose name was Wilson Kemp - a man of the foulest antecedents. These two, finding, that through his ignorance of the language, he was helpless in their hands, had kept him a prisoner, and had endeavoured, by cruelty and starvation, to make him sign away his own and his sister's property. They had kept him in the house without the girl's knowledge, and the plaster over the face had been for the purpose of making recognition difficult in case she should ever catch a glimpse of him. Her feminine perceptions, however, had instantly seen through the disguise when, on the occasion of the interpreter's first visit, she had seen him for the first time. The poor girl, however, was herself a prisoner, for there was no one about the house except the man who acted as coachman and his wife, both of whom were tools of the conspirators. Finding that their secret was out and that their prisoner was not to be coerced, the two villains, with the girl, had fled away at a few hours' notice from the furnished house which they had hired, having first, as they thought, taken vengeance both upon the man who had defied and the one who had betrayed them. 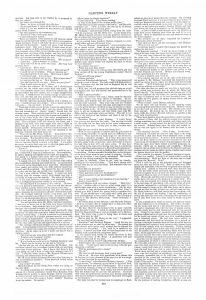 Months afterwards a curious newspaper cutting reached us from Buda-Pesth. It told how two Englishmen who had been travelling with a woman had met with a tragic end. They had each been stabbed, it seems, and the Hungarian police were of opinion that they had quarrelled and had inflicted mortal injuries upon each other. 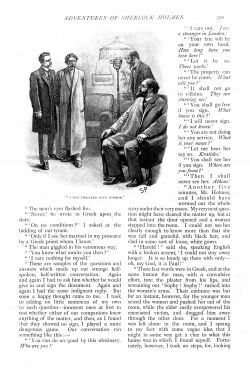 Holmes, however, is, I fancy, of a different way of thinking, and he holds to this day that if one could find the Grecian girl one might learn how the wrongs of herself and her brother came to be avenged. This page was last edited on 28 March 2019, at 18:03.